It wouldn’t be a proper celebration without certain key players. Thankfully, Bandai Namco is looking to build the perfect roster. Their latest trailer showcases a few notable characters, including Kirua and Kurapika from Hunter X Hunter, Yusuke from YuYu Hakusho, and Yugi Muto from Yu-Gi-Oh!. Yes, you read that right. Characters from this popular series have made the leap from card collecting to all out brawls in the streets. 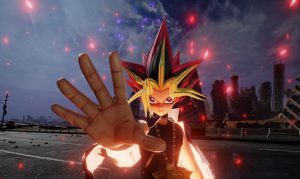 Jump Force is scheduled to be released on the PS4, Xbox One, and PC come February 2019. That gives us plenty of time to speculate on who’ll make the game’s final roster.